Persona 4 is one of those games that either captures your heart, or makes you confused as to why it is popular. It got released years after PS3 came out (and flew under the radar for many because of that), had mediocre graphics even for PS2 era, and takes a few hours before you get into control because of its lengthy prologue. While a lot of people would be put off by either of these issues, beneath all that was a game that captivated me with its characters and gameplay. Exploring Inaba and solving a murder mystery while helping various folk with their trouble was somehow fun, despite me not thinking it would be at first. The scene depicted in the beautiful artwork by Ed Moffatt is one of the most famous for players who are acquainted with Persona 4. 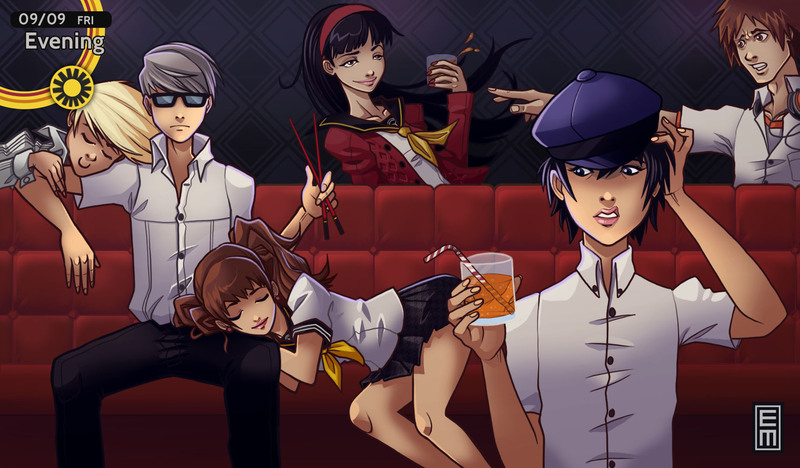 Enjoying their free time on a school trip, the Investigation Team goes into a nightclub and thanks to Rise, a former idol who was supposed to appear at a concert there few years ago (an event that gets covered in Persona 3), they get a private room with drinks and food on the house. Getting drunk on the atmosphere, the group begins playing the famous King‘s game and the whole scene is full of hilarious dialogue and actions. The scene also has various outcomes based on player‘s input, and every one is great. Persona 4 is full of scenes like this one. At the time when I first played this game (along with Persona 3), I was going through rough times. A frequent target of bullying at school, I started having suicidal tendencies, which were fueled by my social anxiety disorder, which was unfortunately not diagnosed until many years later. From a kid that was okay with showing his abilities in front of the class and school, I became unable to do anything without trembling. I also became unable to open myself to others, and started putting on a mask in front of people so I wouldn‘t be bullied or hated. I changed according to people around me, which was not healthy and made me doubt which parts of me were real and which were me acting in front of others. This game, with its focus on friendship and being connected to others, helped me get through those times. It‘s the main reason of why it is so special to me. It deals with hiding parts of yourself that you hate from others, and personal insecurities. Over the course of the game, you help your friends face and accept themselves. By confronting their shadow, they gain strength to fight alongside the main protagonist.Apart from helping your teammates confront their shadows, you also help various people around the town with their troubles. By building bonds with others, you gain more strength to fight shadows and ultimately the main antagonist. But since solving a murder mystery all the time would be exhausting, the game offers a lot of downtime when you get to enjoy the school life and hanging out with friends. The time you spend with this bunch of weirdos is magical and when you get to the end of the game, you will be yearning for more. Nevertheless, as stated in the ending of the game…Doesn‘t matter how far we are, the bonds we made will remain strong. Everyone‘s heart is connected to the people they know and trust. Persona 4 showed me that even though I was having a rough time, it wouldn‘t be like that forever – and I was able to open myself to others and find true friends because of that. The game is one of my all time favourites, and I am glad it gets covered in this project. While it isn‘t that old, it‘s a game I will be playing even ten or twenty years in the future. 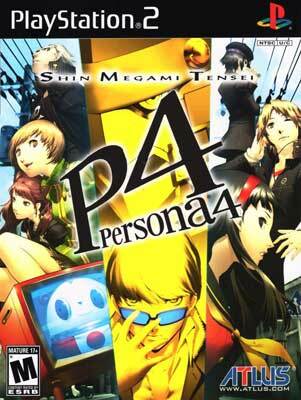 Persona 4 by Atlus is a J-rpg for the Playstation 2 that was first released in July 2008 in Japan before it reached the USA in December and Europe eventually in March 2009. Persona 4 was released two years after the successful Persona 3 and used mainly the same mechanics and artstyle than its predecessor but it had a completely new story with new characters and improved the battle system. Fans criticised that it was only possible to use the main character during the battles, in Persona 4 you can control all characters. The Persona series started as a small Shin Megami Tensei Spinoff game in 1996 with Revelations: Persona for the Sony Playstation, however the series became popular with Persona 3 for the PS2 in 2006. Persona 5 is known as one of the best J-rpg’s of the current hardware generation and the series has a good couple of spinoff games itself now including the fighting game Persona 4 Arena or the Persona Dancing games. Ed Moffatt from Southhampton in England is an important part of the Game-Art-HQ Community now since 2012 when he joined our Street Fighter Anniversary Tribute with his take on Blair Dame from the Street Fighter EX games that were released around 1996-2000. Ed participated in almost every big GA-HQ Collaboration in the following years till today, be it the Link’s Blacklist, our Pokemon Tributes or the FGE Project alongside others. Ed works as a visual designer and draws video game fan art for fun but also worked on the game Discstorm in 2015. Please have a look at Ed’s whole gallery on deviantART here!